My sister in-law is getting married in about 4 weeks and I'm excited for her. The date was just decided in August (! 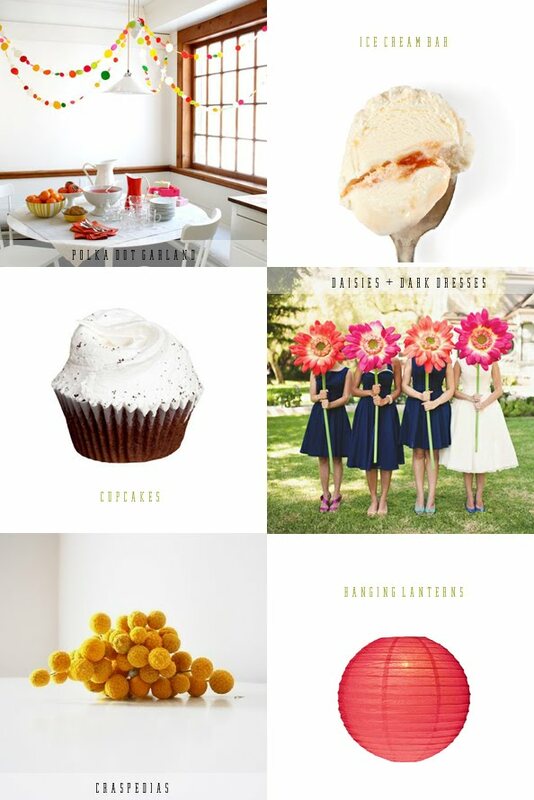 ), so it's a short time frame to plan a wedding within, but I'm loving the simple theme: bold colors and polka dots. It fits perfectly with her fun, laid back personality. polka dot garland, an ice cream bar + cupcakes for the reception, daisy bouquets + dark bridesmaids dresses, craspedias in the floral arrangements, and hanging lanterns in pink, yellow + orange everywhere. What a fantastic theme - love it and surely fairly easy to put together in that amazingly short time frame too! Every time I see Craspedia's I long to get hold of some but alas I can find none around me over the past few years over in my neck of the woods in England. I don't think I can justify a London trip just with the possibility of getting some either - shame! So awesome! I bet this will be a beautiful wedding. The garland is so sweet! aw so exciting. a big congratulations to you and your family! :) she is so lucky to have you for brainstorming and creative ideas. The pokadots are darling! Good luck with the planning! Cute ideas!! Hope it goes well!